Getting good Japanese in the CBD isn’t too hard. You pretty much close your eyes and throw a brick. But in Melbourne’s far north, authentic izakaya restaurants and sake bars are a bit thin on the ground. Which is why, when hospo pros Keisuke Nakamura (ex-Nihonshu, Kumo Izakaya, Ichi Ni Nana) and Aaron Au (ex-Nihonshu, Golden Monkey, Brunswick Mess Hall) wanted a location for their new Japanese eatery, they picked Preston. And trust us—Preston is f*cking glad they did. Dendeke is what all good Japanese restaurants should be. Warm, friendly, fun, a little rough around the edges, with a sake menu that runs over multiple pages. Aaron and Keisuke styled it after the famous Tokyo and Osaka izakaya dens of the 1970s. That means faded rock posters on the walls, retro images from Yakuzu and Japanese biker culture, even Aaron’s original Star Wars memorabilia collection (that’s not technically traditional—he just really really likes Star Wars). It’s like some pop-culture time warp...with a kickass bar. The fit-out is deliberately utilitarian. Lots of brushed concrete, exposed ceilings and rough-cut timber. A few glowing orbs hanging over the bar. The kind of place you’d stumble on in Osaka’s Namba district, or down a backstreet in Shinjuku. Sake and whisky nerds, you’re gonna love this collection. Sake bottles range from $16 (for the Hana Awaka sparkling sake) all the way up to the Rolls Royce Gassan Junmai Daiginjo grade—a lazy $115 a pop. 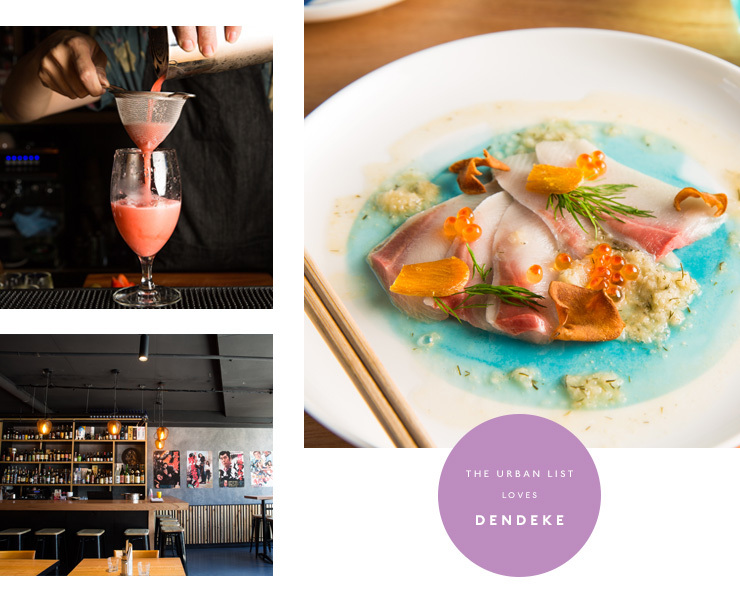 DenDeke even offers sake flights—three boutique tastings for $20. If you’re a bit new to the sake scene, ask your waiter what goes best with your meal. They’ll help you decode the various grades and styles. Now the important bit—the food. Dendeke is open for lunch on Fridays and weekends, dishing up curry rice bowls with pickles, salad and kushi-age skewers (go the Kurobuta Pork, trust us). But the ambiance kicks up a notch at night. That’s when you’ll see izakaya classics like soft shell crab tempura, Agedashi tofu and Kaku-ni slow-braised pork belly whizzing out of the kitchen. One serve of the Otsumami hash browns with smoked paprika salt and seeded mustard. A couple of spider crab sushi rolls for the table. One plate of the crispy-bottomed vegetable gyoza. Then go to town with an assorted sashimi platter (picked seasonally by the chef) and the Kingfish ceviche, dressed in citrus and chilli. A few bowls of steamed rice to share, and a few of the ushi-age deep-fried eggplant skewers. Wash it all down with some Umeshu highballs and a frosty Yamaguchi pale ale. We dunno about you guys, but that sounds like one hell of a banquet. And don’t stress about the bill—the prices are very reasonable for what you get. An 11-piece sashimi platter for $18 is pretty good these days. Especially at this quality. The friendly service helps too. Preston has taken a while to kick the ‘De-Preston’ tag. It wasn’t long ago that you’d have to travel into Northcote just to find a decent bar. But we’re happy to report, those days are long gone. Dendeke is just one of a bunch of new venues opening up over the last few months (check out Takeaway Pizza if you’re in the area), and the locals are bloody lapping it up. Dendeke is open Tuesday to Sunday. You can swing by for lunch on Fridays and weekends, or drop in after 5pm for the dinner service. Just promise us you’ll save room for dessert—Aaron and Keisuke are doing a chocolate fudge cake with Kraken spiced rum butterscotch sauce. We think our work here is done. Want to learn more about Dendeke? Check out our Directory page.